This page will discuss the family of John S. and Mary Halverson Johnson, Oldest son of Sven Johnson. The entire community was shocked last Friday to learn that John S. Johnson was at the point of death with pneumonia, and although many knew that he was quite ill, they had thought that his constitution would be able to withstand the attack. Mr. Johnson was taken sick about two weeks ago with chills and the disease was pronounced pneumonia. He apparently had no cold to begin with. 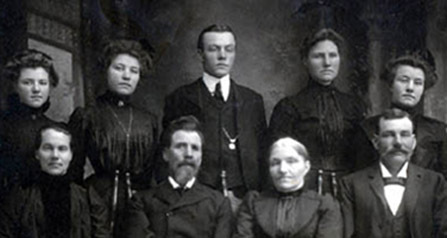 John S. Johnson was born August 7, 1866 in Fagernes, Valdres, Norway, and at the age of two years, came with his parents Sven and Sigri Johnson to America settling in Stanton County. He was baptized and confirmed in the Lutheran church and remained a faithful member. On December 16, 1896, he was married to Miss Mary Halverson of Newman Grove, and they purchased a part of his father’s farm in Stanton County and built up a nice home here. To this union were born five children, two of whom preceded him in death. On account of the lack of good schools for their children they moved to Newman Grove in the spring of 1911. In 1893 he spent the entire summer visiting the scenes of his birthplace in Norway and visiting his relatives there. He returned much rested and recuperated. “My maiden name was Mary Halverson. My name is Mrs. J.S. Johnson. I was born in Wisconsin close to Madison, Wisconsin. I was just two weeks old when the folks cane over here (Newman Grove). My father’s name was Halvor Halverson and my mothers name was Mary (Mary Nelson, daughter of Nils and Anne Nelson, who first married Halvor Halverson and then John Simonson). I was born in 1869. My parents were born in Norway. They were young when they came to the United States. When father died in an accident, mother was thirty years old. I had two sisters and two brothers born before me. I was two weeks old when I cam to Nebraska. We came to Nebraska in 1869. When we came here it was in 1872. They moved to Stanton, Nebraska first. My father was a farmer. He homesteaded down here about 2 miles east of here. We lived in a dugout for a little while. We didn’t live there more that a year and he made a house out of trees, a log cabin. There weren’t very many log cabins here. He made one for us and I think he helped to make another one for someone else. He was a tailor in Norway. My mother was a seamster in Norway. He was going to Columbus with wheat and coming back he dropped one of the lines. We had one horse that was kinda kicky and of course as he bent down to get that line, he was killed. Mother was left with us children. There were some relatives and friends around here, but I can’t remember just who they were. Then several friends from Wisconsin came. Fields was one. We spoke Norwegian in our family. I didn’t know how to talk English until I started school. I went to school at Old Town. There was a school house just across the bridge. You see Old Town was the town that was across the bridge and then of course they built up here and then this got to be a new town and they called that Old Town. There was a store and a post office right in the store, and a blacksmith shop. Newman Grove was built later after we came here. We had to go clear to Columbus to have grain ground for flour, so they went to Columbus to trade. The post office was down to old town. Mrs. Hoffman took care of the post office, and she was postmistress there for a number of years. Newman Grove got its name from a man who use to live here by the name of Newman, by the way I understand it. There were some Norwegians here when the town first started. My father was here. There were American people, I don’t know what nationality they were, but they spoke English. The first school down at Old Town was all Norwegian. I don’t think that the teacher could speak Norwegian. Her name was Emma Jackson. Then there was a man teacher, his name was Mr. Square. He was my first teacher. In Old Town in a school house that is close to the bridge, there is a home there now. The school is up here now in New Town. I went to school all the time in Newman Grove. In later years there got to be ten years. At first if you got through the eighth grade, you were pretty smart. We had a lot of good things to eat in the early days. They always butchered and then cured their own meat. Mother made flot bread, lefsa, soup and all kinds of bread, rye and white, and I cam remember of the folks having so much to eat all the time, we never starved. Norwegian food. I think some of these American ladies taught her to make pie. Now they make pie in Norway, there isn’t much difference between here and Norway that is the way I understand it. Mother made vegetable soup. She put rice, barley and many different things in it. At first it was kind of scarce for coffee, so they used to buy the green coffee and then roasted it and grind it in the coffee mill. That was for years that it lasted. My family organized the first church here. There were two denominations. Now we have the Trinity and the Hauge. Then there was the Trinity church that I belong to now. I went to Sunday school in Hauge and was confirmed in Hauge Church, and married there. It was located right down not very far form where it is now. It is a little different. There is a residence there now and filling station. They moved a little west when they built that new church. Then they have added parts to it at different times. It is a very nice church. The services were in Norwegian. Then came Methodist and there is a Methodist church and we young folks went there sometimes, too. They stopped using Norwegian for quite a few years now. It isn’t so many years that we had a minister that preached in Norwegian if anyone wanted it. I still talk Norwegian. There are a few that talk It around here and we talk it quite a bit. My husband and I both are Norwegian and we talk it sometimes. The kids never learned it. We never talked it enough. I was married in my home our in the country in 1896. Mr. Johnson was a farmer. His father (Sven Johnson) was a layman, farmer, mason, blacksmith, carpenter, he was everything, he could do anything. He came in the early days and learned everything he could. There were people around that would never go to town; they would just come there to get work done. He build houses for different ones. He was a swell tailor. He was awful handy. My husband never learned those things so much, he learned farming. I have three children living, and then we lost two boys. Leonard is in Spokane, Washington working on the railroad. He is a carpenter. Then Sherman, he is the oldest boy; he lives on a farm at Stanton, where my husband was raised, grandpa’s place. Helen lives here in town. I lived on the farm a good many years. We lived fifteen years down in Stanton, and then we moved up here on account of the kids to go to school. They had school down there at Stanton but we would have to drive a ways. We wanted to live where the kids could go to school. So, we then moved up to Old Town. They went to school and graduated all three of them. The railroad came in not far from down here and the old location wasn’t so good, so they moved up here where they could have more room. There used to be a farm here. The clerks in town could speak Norwegian. The business was carried on in Norwegian. There was a Mr. Hovland, he was a Norwegian that came to the new country and started the store and run it for many years. He was a Norwegian and his wife. We use to hear the folks on the street speak Norwegian all the time. There are a few that sill do. But very few. We always had luetfiske at supper Christmas. We don’t have that any more. We had a minister here that didn’t think we should. That was a way of making money. We had lefsa, flot bread, rummegraut. It is made out of cream. Just half sour cream and then a lot of them are crazy for it. They didn’t think there could be any dinner without that. We always had that. We used to cook up to 3 or 4 gallons of that cream. It was really good. We never had anything but the best cream. We had pie, cake, and everything you could think of. We have kringla prenels and fattigman. That was a funny way to give that name because it was made out of starch, but that is what they called it fattigman. It means a fat man. We had a lot of singing. That was all that I liked to do was sing. I heard a tune and it didn’t take me long to learn, and my brother and sisters like to sing also. My mother was an awful good singer too. We used to sing Norwegian songs, but I don’t think I can remember any of them any more. A custom of playing tricks called yulebok was you would dress awful funny and you would wear a mask. They wouldn’t know who your were. They would try to guess, but they weren’t supposed to tear your mask off or anything. They would dress up just awful. Some of them would wear a night dress over their clothes. They would go from house to house. They would just kinda of shake hands with them and talk to you. Sometimes they would know you. Oh, I use to do that. It was something like Halloween. They used to be tickled pink to have us come, especially the older people that couldn’t get out. If they had treats, they would treat you. They did that back in Norway. The custom came from there. In English that means Christmas goat. There was a Norwegian doctor here by the name of Sanderson. He was good too. In all kinds of weather that he would be called to, he would maybe have a team of ponies, they had hard times. Burial was in Hope cemetery. Nephews serving as pallbearers were Lewellyn Strand, Harlan Johnson, Ramon Jacobson, Arnold Curtis, Harry Ransen, and Dean Broberg. Mary Bertha Halverson, daughter of Marit and Haldar Halverson, was born in Wisconsin Sept. 21, 1869. The family moved to Stanton in 1870 where they stayed for a short time before moving to a homestead located on Shell Creek a mile east of Newman Grove. Her family was one of five pioneer families here at that time and they experienced a great many of the pioneer problems of that early day. She was baptized and confirmed in the Lutheran faith. 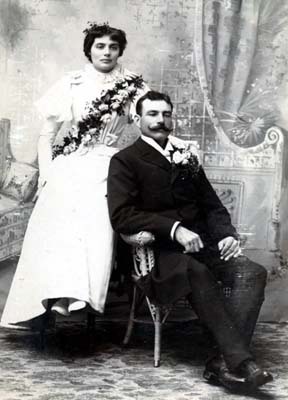 On December 16, 1896, she was united in marriage to John S. Johnson of Stanton where they lived for 15 years. They moved to Newman Grove in March of 1911. Five children were born into this home, Helen, Sherman, and Leonard and two boys who died in infancy. Her husband preceded her in death in January of 1921. She was also preceded in death by her parents; four sisters, Mrs. Henry Strand, Mrs. Mons O.M. 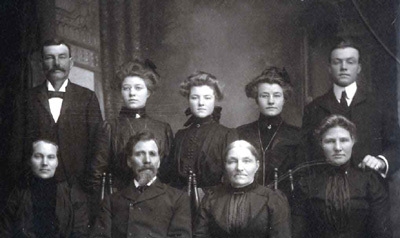 Johnson, Mrs. Tom Christensen and Mrs. Alfred Saare; three brothers, Halvor (Haldor), Marin, and Albert Halverson. When Mrs. John Simonson came to Shell Creek in 1870, there were only five settlers in this community – John W. Bloomfield, William Menice, Lewis Warren and Nels Nelson, sr. and his son, Nels Nelson, jr. Mrs. Simonson, with her former husband, Haldar (Haldor) Halverson, came from Valdres, Aurdal, Norway to Wisconsin in 1866 and by train to Columbus in 1870. The Halverson family went to Stanton from Columbus for a brief stay while Mr. Halverson traveled a-foot looking for a homestead. 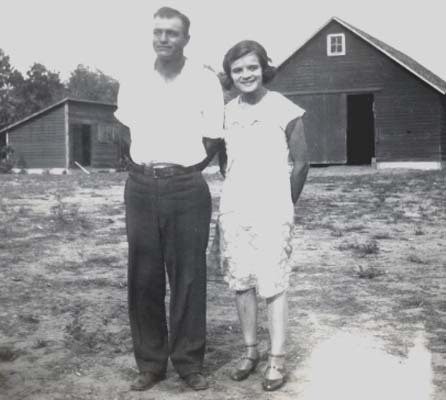 He walked to the Shell Creek neighborhood and entered government land one mile east of Newman Grove, built a dugout and sent for the family, his wife, Marit, and four children, Annie, Julia, Halvor and Mary. The oldest of these children was around ten years old. This family started life in a dugout on the land where the golf ground is now located, without a team of any kind, without wagon, plow, farm implements or tools except an ox. The neighbors helped to put in a few acres of wheat the first year, and this Mr. Halverson cut with a scythe or cradle, raked it up with a flail and fanned it by hand in the wind. He bought two steers on time but he had no wagon so he made a sled out of green timber and hauled his winter’s supply of hay after cutting it with a scythe. Mr. Halverson was a log house builder from the old country and he obtained employment from Lewis Warren, building a log house – the house now owned and occupied by Lars Olsen. He also built a log house for George A. Whitcher on his homestead. This house had a floor in it, an innovation in those days, and it was here that the first dance in Shell Creek precinct was held - accordion music - but the name of the player is not known. He trapped wolves, mink, muskrat and beaver, and made overshoes, mittens and caps for the family out of the furs. Prairie chickens were caught in wooden traps, and with fish from Shell Creek and other game the family had a good meat supply. A log house was built for the family after about a year in the dugout, a wagon, farm implements, tools, a team of horses were acquired and conditions were happily improving. The Halverson home was a place where all new settlers came to stop until they could get located. L.M. Johnson and John M. Johnson stopped there, the Syver Field’s lived there, camping in covered wagons, the Jackson’s camped near their land, and many other settlers stopped there. A tragedy occurred in the family November 4, 1875, the first in Shell Creek. Mr. Halverson was killed in a runaway on his way back from Columbus hauling merchandise for George B. Hovland, about three miles south of Platte Center. John M. Johnson and Mr. Hovland brought the body home as soon as possible. He was the first one buried in the Trinity church cemetery about two miles northwest of Newman Grove. He was a charter member and one of the organizers of the Trinity Lutheran church. The widow, Mrs. Marit Halverson, who later married John Simonson, was a typical pioneer house wife, physically strong, fearless, frugal, resourceful and born with a since of humor. The Indian raid had occurred a few months before they came here in 1870. the story of how the Indians entered Nels Nelson’s house, took his gun, shot and wounded Mrs. Nelson, and threw the gun in the creek was told and retold. The gun was found many years later by Lewis Hovland and other boys in the creek below the school house where Mrs. Thorsten now lives. The Indians came up the valley several times after the raid and Mrs. Halverson learned to deal with them in a friendly way giving them butter, dried meat, bread and other eatables. Indian mothers greatly admired the youngest children, and indicated that they would like to have one. Once an Indian drew a sword, standing in the doorway feeling the edge with his hand, but he indicated by tendering ring that he was not hostile. The Indians had been emphatically warned by the government since the Warren raid, not to molest the white settlers. Soldiers were camped along the border about twelve miles apart. One soldier camp was stationed on Shell Creel about eighty rods west of the Old Town. Mrs. Simonson exchanged her good homemade bread for cracker4s and canned goods which were rare articles those days and she washed clothes for them and mended their uniforms. During the April 1873 blizzard Mr. Halverson, about the second day decided he would have to go out look after the stock. The wind sounded like it was rushing into a huge vacuum and the snow was so blinding that the hand could not be seen at arm’s length, they twisted a long string out of shoe makers tread and Mr. Halverson went to the barn holding one end of it. He did not return in due time and Mrs. Halverson, finding the string was broken, stepped out holding the door latch and yelled several times. After a few minutes Mr. Halverson appeared and told how he had missed the house and was going away from it out in the storm. A pack of wolves gathered on the mound roof of their dugout one snowbound winter night. The children were frightened when they heard the weird, howling sound above their heads and Mr. Halverson went out with the ax to scare them away. The log house was built about the year 1872, and later moved to the location where the Ole Johnson H., farm house now stands. The same log house was again moved to the John Simonson homestead where N.W. Kronquist now lives. In 1867 she was married the second time to John Simonson. She was born on the 4th day of August 1835 and departed this life at the age of 75 years, one month and 23 days. After her second marriage she affiliated with the Hauges Church and took an active part in the work of that church. The John Simonson children, Hannah, Simon J., and Albert J., were all baptized and confirmed in the Hauges church. Mrs. John Simonson has about fifty descendents, children, grand children and great grand children, surviving her. Childhood life on the frontier is a subject deserving mention in the history of this family. There were six children in the Halverson family, Anna, (Mrs. Henry Strand), Julia, (Mrs. Mons O.M. Johnson) Halvor, Mary (Mrs. John S. Johnson), Caroline (Mrs. Tom Christensen) and Martin. Caroline is supposed to be the first white child born in Shell Creek. The four eldest were born in Wisconsin. When they came here there were no school mates or play mates in Shell Creek. They were the first white children in the settlement the outdoors, nature and the home were the only sources of amusement. Fishing in Shell Creek was a pastime as well as a duty in the summer time. In the winter they ran out morning and evening to see if the wolf and beaver traps had anything in then; and they got the prairie chickens from the wooden traps in the fields. They played around the soldier camps and were extremely popular with the soldiers. Chores, housework, fire side stories and religious instruction occupied their time about the home. Julia (Mrs. Mons O.M. Johnson) can remember seeing the antelope bounding ahead of a sweeping prairie fire. She walked often to a school house about a mile north of the South Branch church to attend Confirmation class instructed by Rev. Hillman, with Jennie Strand (Mrs. Geo. Johnson), Gullik Oss, Mary Thompson and others. An infant brother died at sea when her parents came to America. She remembers her father telling that he was charged $5.00 for stopping over night with a farmer when he walked from Stanton. These pioneer children recall the Texas Cattle Trail when thousands of long horn cattle passed through the Shell Creek valley, driven by wild cow boys. Julia is the oldest of the Shell Creek precinct settlers now living here. Matt Olson has about the same length of residence but his folks were farther to the south east in Platte County. The first picture below shows the Marit Halverson family. 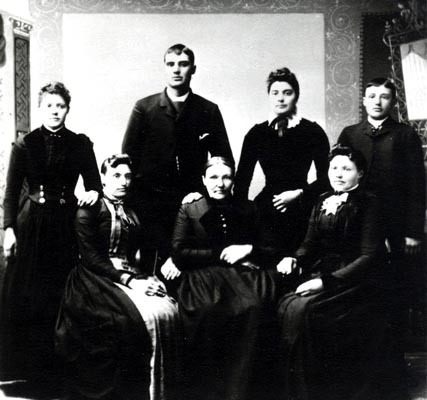 In the back row, left to right, Caroline (Mrs. Tom Christensen), Halvor (married Anna Simonson), Mary (Mrs. John S. Johnson), Martin. In the first row: Julia (Mrs. Mons. O. M. Johnson), Marit (mother, wife of Haldor), Anna (Mrs. Henry Strand). 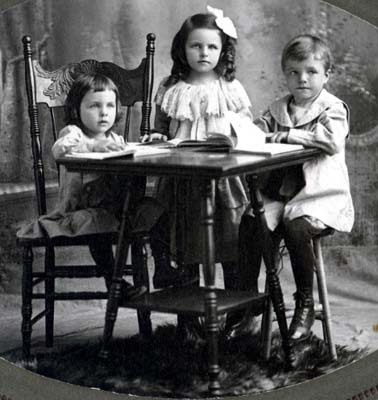 The first picture below shows Leonard, Helen and sherman. 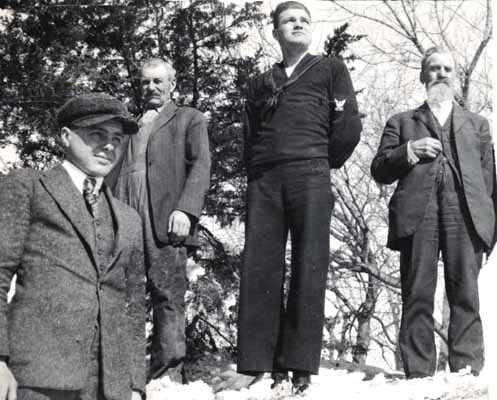 In the second picture we see Leonard, John S., Sherman and Sven. 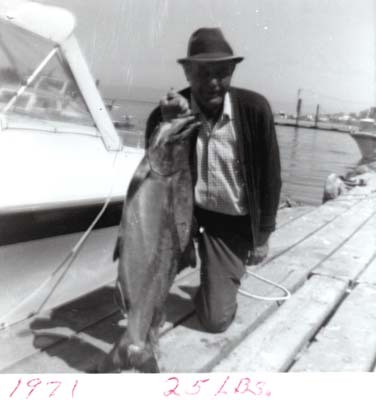 The first picture below is of Leonard with his 25 pound Silver Salmon taken in 1971 at Neah Bay. Washington. The next picture is of Sherman and Ursula Rosa Ziegler Johnson. This picture below is of the Sherman Johnson family. 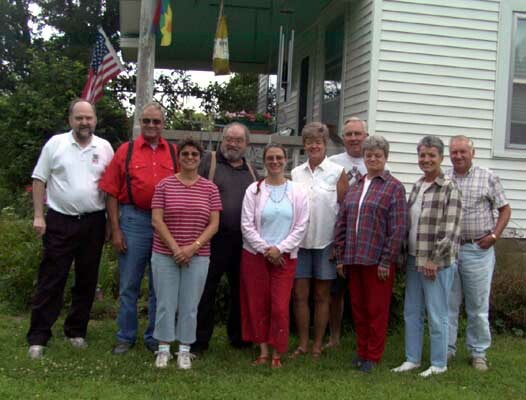 The following picture was taken in 2004 and includes the following left-to-right: Gene Johnson, Sherman Johnson, Jr., Linette (Johnson) Hess, daughter of Lawrence Johnson, Lawrence Johnson, Pamela (Johnson) Rumery, daughter of Lawrence Johnson, Judy (Johnson) Godel, George Godel, Judy's husband, Nancy (Johnson) Scott, Linda (Johnson) Stiles, Vaughn Stiles, Linda's husband.